The abdomen (less formally called the belly, stomach, tummy or midriff) constitutes the part of the body between the thorax (chest) and pelvis, in humans and in other vertebrates. 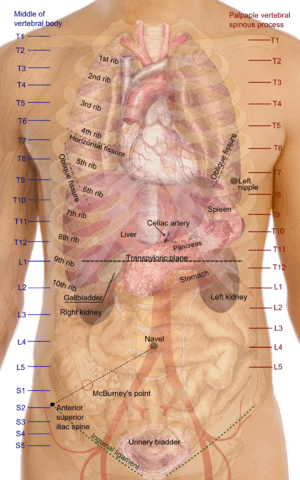 The region occupied by the abdomen is termed the abdominal cavity. In arthropods it is the posterior tagma of the body; it follows the thorax or cephalothorax. The abdomen stretches from the thorax at the thoracic diaphragm to the pelvis at the pelvic brim. The pelvic brim stretches from the lumbosacral joint (the intervertebral disc between L5 and S1) to the pubic symphysis and is the edge of the pelvic inlet. The space above this inlet and under the thoracic diaphragm is termed the abdominal cavity. The boundary of the abdominal cavity is the abdominal wall in the front and the peritoneal surface at the rear. 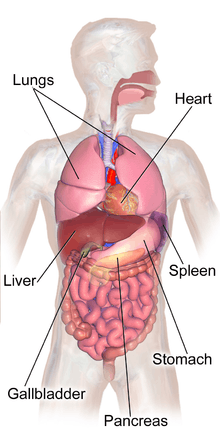 Abdominal organs can be highly specialized in some animals. For example, the stomach of ruminants (a suborder of mammals) is divided into four chambers – rumen, reticulum, omasum and abomasum. In vertebrates, the abdomen is a large cavity enclosed by the abdominal muscles, ventrally and laterally, and by the vertebral column dorsally. Lower ribs can also enclose ventral and lateral walls. 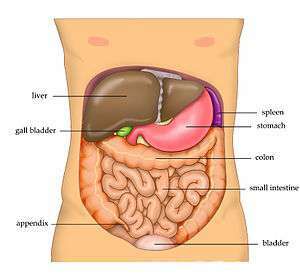 The abdominal cavity is upper part of the pelvic cavity. It is attached to the thoracic cavity by the diaphragm. Structures such as the aorta, superior vena cava and esophagus pass through the diaphragm. 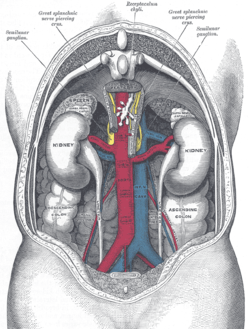 Both the abdominal and pelvic cavities are lined by a serous membrane known as the parietal peritoneum. This membrane is continuous with the visceral peritoneum lining the organs. The abdomen in vertebrates contains a number of organs belonging, for instance, to the digestive tract and urinary system. 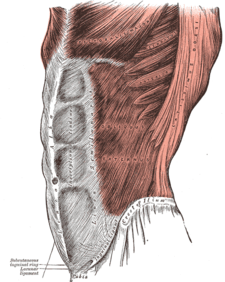 The transverse abdominus muscle is the deepest muscle, therefore, it cannot be touched from the outside. It can greatly affect the body posture. The internal obliques are also deep and also affect body posture. Both of them are involved in rotation and lateral flexion of the spine and are used to bend and support the spine from the front. The external obliques are more superficial and they are also involved in rotation and lateral flexion of the spine. Also they stabilize the spine when upright. The rectus abdominus muscle is not the most superficial abdominal muscle. The tendonous sheath extending from the external obliques cover the rectus abdominus. The Rectus abdominus is the muscle that very fit people develop into the 6-pack ab look. Although, it should really be a 10 pack as there are 5 vertical sections on each side. The 2 bottom sections are just above the pubic bone and usually not visible, hence, the 6 pack abs. The rectus abdominals' function is to bend one's back forward (flexion). The main work of the abdominal muscles is to bend the spine forward when contracting coencentrically. Being a key element to support the spine and contribute to a good posture, it is important to properly exercise the abdominal muscles together with the back muscles as when weak or overly tight they can suffer painful spasms as well as injuries. When properly exercised, abdominal muscles contribute to improve posture and balance, reduce the likelihood of back pain episodes, reduce the severity of back pain, protect against injury by responding efficiently to stresses, help avoid some back surgeries, and help healing from a back problem or after spine surgery. Also, when strengthened, the abdominal muscles provide flexibility as well. The abdominal muscles can be worked out by practicing disciplines of general body strength such as Pilates, yoga, T'ai chi, and jogging among others. There are also specific routines to target each of these muscles. 1 2 3 4 5 "Abdominal cavity". Encyclopædia Britannica. I: A-Ak - Bayes (15th ed.). Chicago, IL: Encyclopædia Britannica, Inc. 2010. pp. 19–20. ISBN 978-1-59339-837-8. ↑ "The Abdominal Muscle Group". Retrieved 2010-07-13. ↑ Jansen JO, Yule SR, Loudon MA (April 2008). "Investigation of blunt abdominal trauma". BMJ. 336 (7650): 938–42. doi:10.1136/bmj.39534.686192.80. PMC 2335258 . PMID 18436949. ↑ Wyatt, Jonathon; Illingworth, RN; Graham, CA; Clancy, MJ; Robertson, CE (2006). Oxford Handbook of Emergency Medicine. Oxford University Press. p. 346. ISBN 978-0-19-920607-0. ↑ al. ], consultants Daniel Albert ... [et (2012). Dorland's illustrated medical dictionary. (32nd ed.). Philadelphia, PA: Saunders/Elsevier. p. 2. ISBN 978-1-4160-6257-8. ↑ Durward, Heather; Baston, Helen (2001). Examination of the newborn: a practical guide. New York: Routledge. p. 134. ISBN 978-0-415-19184-5. ↑ Ferguson, Charles (1990). "Chapter 93: Inspection, Auscultation, Palpation, and Percussion of the Abdomen". In Walker, HK; Hall, WD; JW, Hurst. Clinical Methods: The History, Physical, and Laboratory Examinations (3rd ed.). Boston: Butterworths. Retrieved 2013-11-27. ↑ "Glossary of Descriptive Terminology". Desertants.org. Archived from the original on 2013-05-17. Retrieved 2013-07-08. "Abdomen". Collier's New Encyclopedia. 1921.